Prabhas and Anushka Shetty starrer romantic film 'Rebel' film unit is all set to go to Bangkok in August for shooting. This film is being directed by Larencce Ragava. 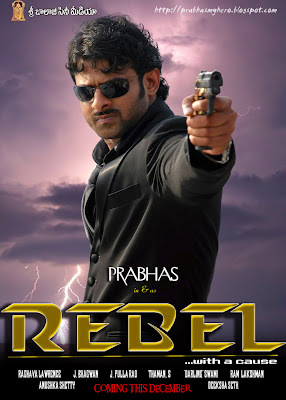 Prabhas is currently shooting at Aluminium factory in Hyderabad for this film.A few action sequences between Prabhas and the villain are being shot now in the city. "Our film unit will go to Bangkok on August 5th and will remain there until September for shooting.We are planning to release 'Rebel' in December" said producer of the film J Bhagawan. Deeksha Seth is also acting in this flick. S S Thaman is the music director while C Ramprasad is the cinematographer. "This movie will be a mass entertainer. Prabhas fans will be happy with the outcome. He will have a very stylish look in the film. I thank the producers for spending a lot of money on this project and co-operating with me" director Larencce Raghava said.